Ponyo: Another Studio Ghibli classic, the story of a goldfish princess who goes off an adventure and falls in love with a human child, causing havoc to the balance of nature. Beautiful animation style. A wonderful glimpse at life in fishing villages in Japan and a mum voiced by Tina Fey, what’s not to love? Well, the story is a bit derivative and the ending seems to just happen, so it’s not the best Studio Ghibli film ever but worth a watch. My Name is Bruce: Bruce Campbell, star of the Evil Dead movies, stars as ‘himself’ in this send-up of B-movie stardom. A bit flat in places, if you’re a fan of Bubba-ho-tep (“everybody likes Bubba-ho-tep”) then this is well worth watching. Prince of Persia: Great special effects, epic scenes and some of the worst ‘English’ accents you’ve ever heard.. even from the British actors. Ben Kingsley and Alfred Molina I’m looking at you. The storyline is a hodge podge of revenge and mythology in the classic style of Tomb Raider, another game to film conversion. A six beer movie at least. The Last Airbender: M Night Shyamalan has not really produced any classic suspense movies in a while, so I was interested to see how he fired up this new trilogy. The answer? 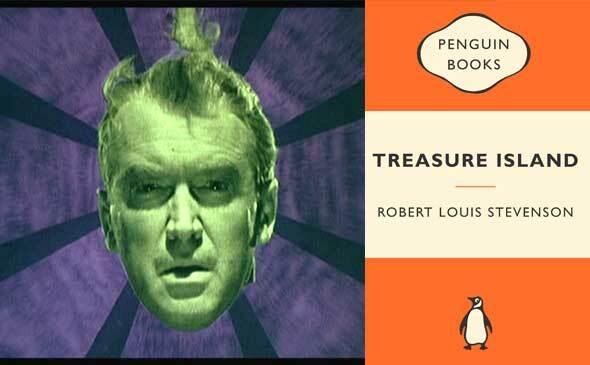 Beautifully shot, with some great special effects, but none of the Shyamalan story magic. Finally got around to watching this brooding masterpiece of a film last night. For some reason I’ve always gotten There Will Be Blood and No Country for Old Men mixed up in my head, purely because they were on at the cinema at the same time. There is absolutely no relationship between the two movies, one being about a slightly psychopathic oil man in the earliest days of prospecting, and the other being about a man on the run from a psychopathic killer. Oh wait. Guess there are some similarities after all.. both are great movies but as dark as anything, ‘No Country’ is a Coen Brothers movie in the style of Fargo without the humour so don’t expect light watching with either. There Will Be Blood is a real powerhouse of a movie. Daniel Day-Lewis takes the lead as an oil prospector, Daniel Plainview, who works his way up from the bottom through his own hard work and cunning, yet still acknowledging that only one in twenty prospectors ever strike big. Along the way he loses a lot of compatriots, and makes few friends, being unrelenting in his pursuit of oil success. After achieving some early finds, he is approached by a young man who tells him of oil on his farmstead in return for money. Plainview visits the farm and finds the boy’s twin brother, Eli Sunday, a fanatical Christian played with creepy genius by Paul Dano. Buying up the farm and the surrounding area, Plainview grows his empire – facing loss and gains along the way, within a circle of his own self-created loneliness. There is no redemption in this movie for the principle players, just dark drilling into the human soul and psyche. The beauty here lies in the cinematic vistas of early oil fields, and the starkly wonderful soundtrack by Johnny Greenwood of Radiohead fame. There Will Be Blood is a must see movie, but have a cheery follow up film as a follow up – for us it was The Triplets of Belleville, a quirky French animated movie about one Grandmother’s quest to cheer up her Grandson with surreal consequences. Very enjoyable. Most of you will know about my mild obsession with Terry Gilliam and his amazing films. Gilliam’s movies are some of the most regularly re-watched in my extensive collection, along with those of the Coen Brothers and Christopher Nolan. 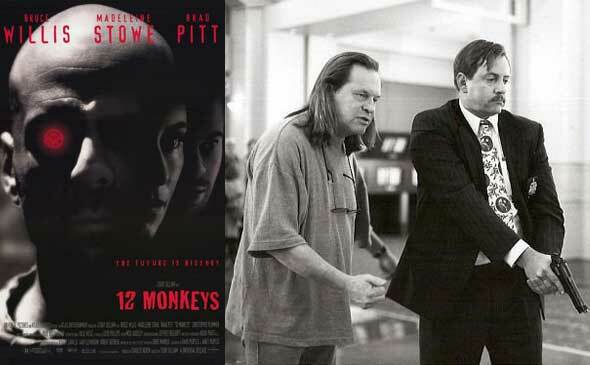 All of them delight in visually stunning extravaganzas combined with off-beat yet engaging characters, and Twelve Monkeys is no exception. Twelve Monkeys is Gilliam’s 1996 sci-fi time-travel confuso-thriller starring Brad Pitt, Bruce Willis and Madeline Stowe amongst others. The basic story is based around the surreal French short film La Jetee, centering around a man from the future who has seen his own death as a child. In this re-telling our soon to come dystopian future has the remnants of he human race living underground, holding on after a devastating virus has killed most people. Willis plays James Cole, a prison inmate chosen to go back into the past to try and investigate what happened and ultimately retrieve a pure source of the original virus so the future/present scientists can create a cure. With me so far? Well there be spoilers ahead, so be warned. Last night we went to see the Coen Brothers’ latest, Burn After Reading, at the Curzon Soho – after an abortive attempt to go see it at the over-mirrored, off-putting Apollo Picadilly. For those of you who don’t know, Burn After Reading is a dark comedy set around the ‘Intelligence’ scene in Washington DC, with a roster of acting stars the likes of which is normally only seen in Soderberg movies – Brad Pitt, George Clooney, Tilda Swinton, John Malkovitch, Frances Dormand and many more. With all those talents vying for space you’d think the movie might end up over-baked, but it’s an amazing set of twists, turns, laughs and surprises as you might expect from such talented film makers as the Coens. 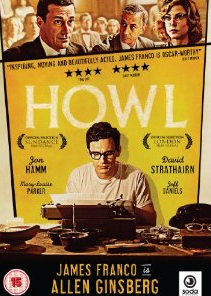 Definately a must see, especially for fans of the Coens. The Curzon was, as usual, showing an interesting range of previews most of which looked like great films. One in particular caught my eye – Steven Soderberg’s two part epic Che. This true to life biopic, previously called ‘The Argentine and the Guerilla’, follows the life of Che Guevera from his early days as an Argentine doctor through to cultural icon that he is now. Che is played by Benicio del Toro and goes through an amazing range of body sizes along the way. All looks very exciting, although the early reviews are somewhat mixed. BTW, How come it costs £12 or more to go to the cinema in London these days? This comes as a brutal shock after getting used to $12 in New York for, what I’d imagine, is the same film just with bigger, more comfortable seats (to fit the larger gentleman). I don’t think cinema’s can blame pirates for a decrease in film attendance when they’re gouging us like that! Author Matt HobbsPosted on November 19, 2008 Categories MusingsTags film reviews, London, moviesLeave a comment on Don’t Burn After Reading! 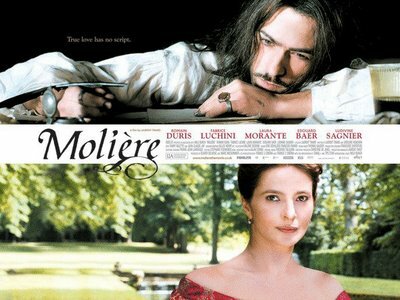 Molière is a French period movie set in the 17th Century and starring the wonderful Romain Duris, puppy eyed lead from The Spanish Apartment (L’Auberge Espagnol). The story follows the life of the French actor and playwright Molière through a period of his life that historians don’t know much about, imagining what happened based on his own plays. So Molière gets thrown in debtor’s gaol in Paris, only to be rescued by a rich benefactor, Monsieur Jourdain, who wants to learn the fine art of acting in order to impress a woman he’s fallen in love with. Taken out to the country we meet the other players in this act, Jourdain’s wife and daughters, and members of the French royal court – nicely setting off the beauty of the sets with their internal ugliness. Molière is a great movie, deep, visually stunning, yet hugely funny and moving. Romain is at times dark and brooding, then generous and funny, and all fully fleshed out by his highly talented portrayal of a complex character. Definately a must see, even if you’re not a great fan of sub-titles. Read my full review of Molière here. A movie night last night, starting with Darren Aronofsky’s ‘The Fountain’, filmed here in Montreal three years ago, and Mighty Wind. The Fountain got mixed reviews which stopped me seeing it in the cinema, and after Requiem for a Dream Aronofsky had a lot to live up to, and having watched it I can see why – it’s not easy going, and not a cheerful, Hollywood movie that’s for sure – but then when are Aronofsky’s movies ever like that? Cut to the chase – the movie is stunning in places, dramatically wrenching and beautiful with some great acting. So I highly recommend it to everyone. Onto Mighty Wind, another ensemble comedy piece from the team behind Best in Show and the folks from Spinal Tap. With those credentials you would expect some laugh out loud faux documentary moments and it doesn’t disappoint there, however overall the film left me un-satisfied. Mighty Wind seems to lack any real drama and just meanders along like a folk Spinal Tap that only goes to 6, not 11. There is some standout acting in there but don’t expect too much. You can read my more detailed reviews here: Mighty Wind and The Fountain.